Taking blood is a fine art. Even the most experienced practioner may require more than one stab to find a vein—seems only natural to wonder, might a robot do the job better? Mountain View’s Veebot thinks so. Veebot wants to take the art out of needlework with their robotic venipuncture machine. In the litigious healthcare industry, if they get it right, one imagines there will be a market—maybe a big one. According to Veebot, there are two million reported needlestick injuries a year. 20% to 25% of all venipunctures miss the mark on their first attempt. The danger may seem minor—two tiny pinpricks instead of one. The problem is failed “sticks” don’t only result in a little discomfort and a second attempt. Sometimes practitioners miss the vein and hit a nerve instead causing temporary to permanent damage depending on the depth of the miss. Worse, needle-related injuries aren’t limited to patients. Fact is, most injuries occur on the other side of the operating table. Healthcare practitioners are exposed to needles from start to finish, resulting in unintentional “needle stick” injuries and exposure to blood-borne disease. Beyond injuries, human error results in potentially disasterous mislabeling of patient samples. Mislabeling is responsible for 170,000 “adverse events” and $200 to $400 million in costs a year, according to Veebot. 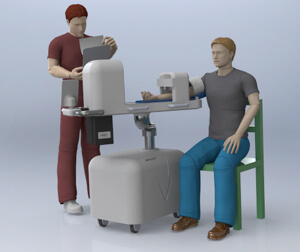 Veebot’s system will secure the patient’s arm in place underneath imaging equipment and robot needle. 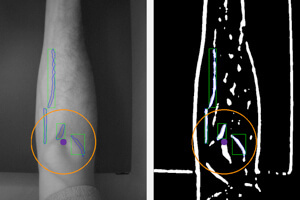 The healthcare provider views images of the patient’s arm—infrared for general vein location, ultrasound to zero in on the vein of interest—and hits go. The machine takes it from there, drawing blood, capping and labeling vials, inserting IVs, administering medicine, and making the needle safe for disposal. Veebot uses infrared to locate veins and ultrasound to hone in on the right one. There are competitors—though none seems to offer the total package. PocketSonics makes handheld ultrasound imaging devices and IRIS uses infrared imaging. Veebot includes ultrasound, infrared, and automation. As yet the machine’s costs are unknown. But compared to potential legal costs of needlestick accidents, one imagines the price tag would have to be truly unreasonable to miss the market. What are the odds every hospital will one day use robots to draw blood? The technology seems more than feasible. Human eyes can’t see under the skin. 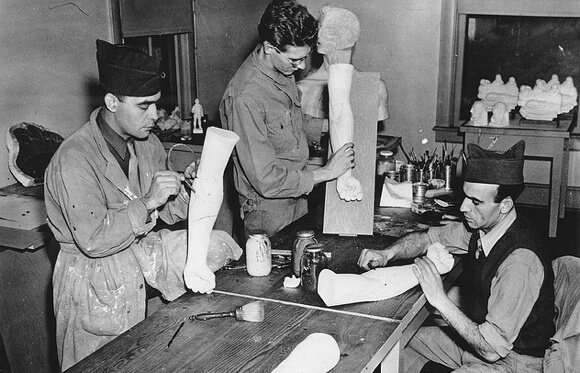 Human hands can’t repeatedly find their mark with precision. The human brain can easily confuse patient samples. It’s a simple, repeating process well suited to robots and demonstrably prone to human error.